Imagine starting your morning off with a warm and pillowy-soft cinnamon bun. Now imagine that cinnamon bun with bananas. I think I’ve found my kind of cinnamon bun. As mentioned in the past, I’m not a huge fan of cinnamon buns (I know, shocking!). But a conversation I was having with Joel last week as we walked by a Cinnabon reminded how long its been since I last baked cinnamon buns (over a year ago!). 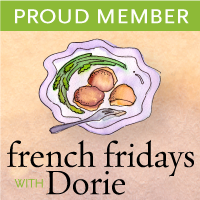 It was about time to bring out the buns again, and what better timing than with the monthly brunch meet-ups with my book club. The book club I’m part is made up mostly of some girls from my publishing program last year that I’ve become good friends with. Cinnamon buns were one of the first things I baked for my class last year as a little morning pick-me-up, so I thought it was fitting that I bring cinnamon buns to brunch as a little blast from the past. I had some super overripe bananas that have been taking up space in my fridge though and wanted to get rid of them. I ended up throwing them into the dough and hoped it would be as delicious as I envisioned it in my head. Soft and gooey. Not too sweet with a distinct banana flavour that works so well with the cinnamon. Any cinnamon bun lover will fall in love with these ones. Heck, even non-cinnamon bun lovers will too (like moi!). Best of all, these cinnamon buns rise overnight, ensuring that you and your family can enjoy hot and fresh cinnamon buns straight from the oven without having to wake up at an ungodly hour to make them! In a small bowl, stir 1 tablespoon of the sugar into the warm milk. Sprinkle the yeast over the milk and let rest for 10 minutes. While the yeast is coming to life, in a separate bowl, stir together the flours, cinnamon, remaining tablespoon of sugar and salt. Set aside. In the bowl of an electric mixer, place the mashed bananas, melted margarine and the yeast/milk mixture after it has bloomed. Using the paddle attachment, mix the ingredients on medium low until well combined, about 2 minutes. Add half of the flour mixture to the mixing bowl and stir to combine. Slowly mix in the rest of the flour and mix. Switch the attachment to the dough hook. At this point, your dough may still feel quite wet and soft. Add some flour, a tablespoon at a time, while the machine is running on medium low until the dough starts to come away from the bowl. Knead for about 10 minutes. The dough will be ready when it has formed a nice ball, but is still very soft and slightly tacky to the touch, but comes away cleanly from the bowl. Place the dough in a greased bowl, cover, and allow to rise in a warm place for about 1 hour, or until it has doubled in size. Punch the dough down; cover and let rest for 5 minutes. While the dough is resting, melt the butter. In a small bowl, combine the sugar and cinnamon. Set aside. Roll the dough into a 12 x 10-inch rectangle on a floured surface. Brush the dough with the melted butter and sprinkle with the cinnamon sugar mixture, spreading it around the whole surface of the dough with your hand. Drizzle the surface with the remaining melted butter. Roll up the rectangle tightly, from the long side, and pinch the seam to seal. Cut the roll into 12 even slices. (This will be a messy process, as the sugar/butter mixture will start oozing out. Don’t be afraid of it. Just go at it.) Place the slices, cut sides down, in a greased 9-inch square baking pan. Give them a little bit of space in between as they will rise. Cover with plastic wrap and pop them in the fridge to rise overnight. 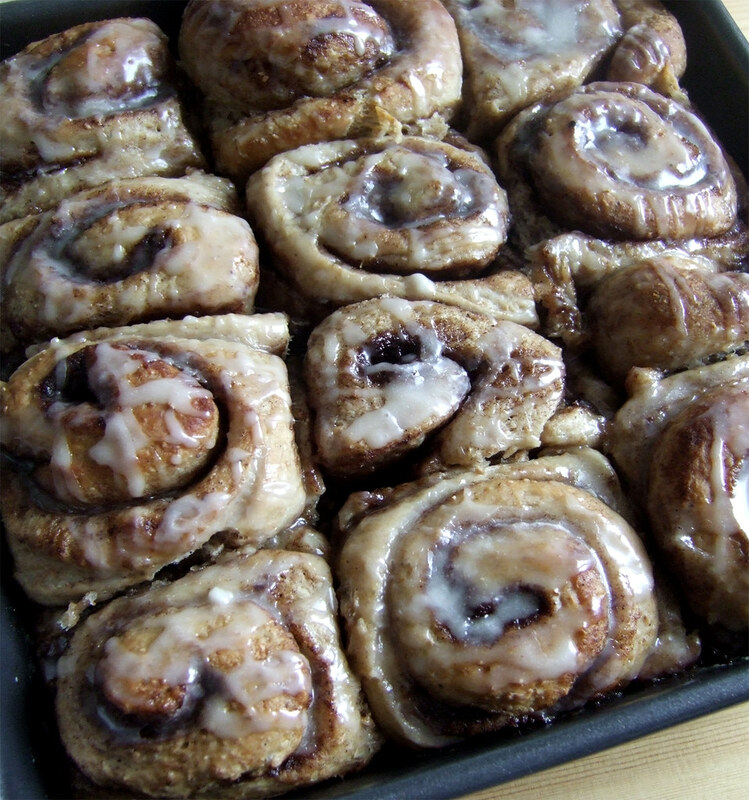 In the morning, pull the cinnamon buns from the fridge a half hour before baking and place them on top of the stove while the oven preheats to 375°F (if using a glass or dark-coloured pan like I was, reduce the temperature by 25°F). Bake for 20 to 25 minutes, or until light golden brown. 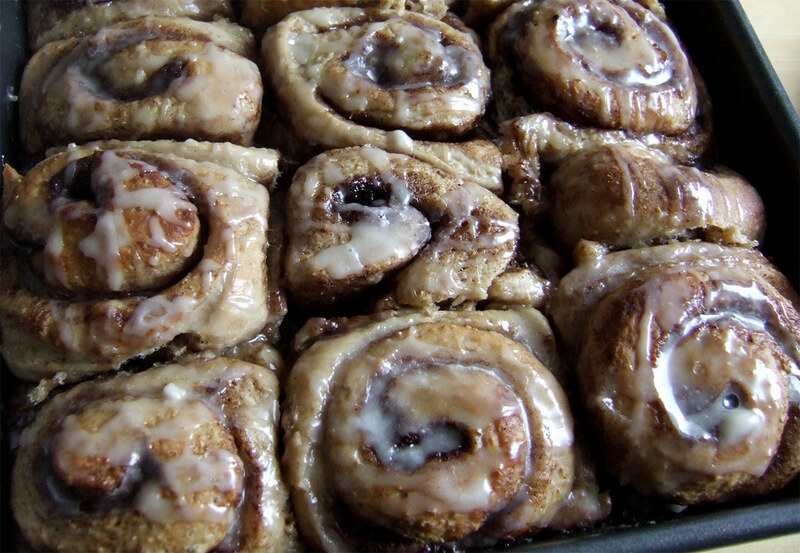 Remove the cinnamon buns from the oven and set on top of the stove to let cool a bit. In a bowl, whisk the icing sugar with vanilla extract and maple syrup. Start with just a tablespoon of hot water, adding more as needed. You want a consistency that’ll allow you to drizzle the glaze over the cinnamon buns. Drizzle the buns with the glaze and serve immediately! Posted by Bonita at 5:39 p.m.
Michelle Jadaa August 26, 2011 at 9:10 a.m.
Angela Yung July 10, 2012 at 11:49 p.m. I have these in the fridge right now and I can't wait to pop them in the oven tomorrow. ThatNuttyTart October 25, 2012 at 3:45 a.m. Anonymous December 25, 2012 at 2:40 p.m.
Hey thanks for the recipe inspiration! I made this early Christmas morning. I guess Santa woke me up at 4:30 a.m. and I couldn't go back to sleep. I ended up having only one banana on hand-- my other bananas were too far gone to use. So I subbed one banana for one persimmon. It's about the same quantity but a lot more moisture, so I had to use more flour. I also subbed out about 1/4 tsp of the cinnamon for pumpkin pie spice. They came out very moist but very good! Totally didn't need the glaze, though that was good too. Next time I would add nuts to the filling. Alanna February 7, 2013 at 9:05 p.m.